Home / Intro / Why do you Flair…? Why do you Flair…? Its a simple question with not always a simple answer. Depending on the occasion, you might Flair for your guests, you might Flair for the judges, you might Flair for your fans, you might Flair for yourself… you might Flair because its just a natural extension of how you bartend. Some of us can’t go an entire shift without incorporating some kind of Flair while bartending. Whether its a simple tin spin or a glass toss behind your back… it just seems natural and effortless sometimes. One thing I’m not seeing enough is bartenders Flairing for the betterment of Flair. I see a lot of bartenders Flairing for the reasons mentioned above… but what about Flairing for the better of our sport. What about Flairing regardless of the prize money… regardless of Flairing to win a competition to help promote myself… regardless of whom I’m competing against… what happened to putting the sport before ourselves? As we are rebuilding Flair in the United States we have a great opportunity to rebuild it in a better way. Showing Flair bartenders can make proper cocktails… showing craft bartenders they can have fun behind the bar… and more importantly… if we are going to survive long term… showing the sponsors we give a damn about them and value their time and money invested into our sport. Our sport… so lets regrow it together in the right direction starting now. So I ask you, our loyal Flairbar.com readers… Why do you Flair? We start with our an individual who has helped put Flair back in the spotlight and growing it the right way… Mr. Dean Serneels…with “From Bartender to Bar Innovator”. Dean shares with us his past and present insights on the world of professional bartending. Get to know all of that and more all on our ‘Interviews‘ page. Then we heat things up with “Fire in the Sky: Becoming One with Performance Fire Flair” by Robbie Flair. Robbie shares with us how he started out learning how to utilize Fire Flair behind the bar and in his shows. A very dangerous tool and we recommend only experienced professional use safely. All on our ‘Articles‘ page. What are your thoughts on the subject? Do you have an article you would like to share…? Message us on our Flairbar.com Facebook page and lets discuss. Then we have “Lemons, Limes & Smoke” from Kris Bahamondes up in Canada to help inspire your ever growing cocktail list, all on our ‘Flavors‘ page. The cocktails Kris comes up with are amazing! Next we have “The Power of Tiki Cocktails” on our ‘Flairmation‘ page. In this issue Freddy is enjoying Tiki cocktails for the first time. All thanks to Beach Bum Barry! Moving on to our ‘Barware‘ page this month which showcases “Precision Pouring… in a Flash!” from Rob Turek. These pour spouts do more then just blink… they help you think. Check it out all on our ‘Barware‘ page. Finally we have the “Olybet Flair Mania Finals 2015″. Check out the finalist’s rounds from this amazing showcase of skill and talent behind the bar very well filmed and edited. Not bad commentary as well… love you Collin Griffths! All on our ‘And Finally‘page. All of that plus our regular features, more pages, and more Flair than you can shake a competitor choice bottle at. 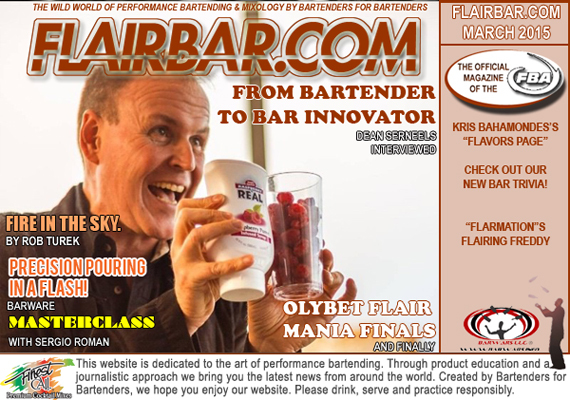 So take some time out and enjoy a Finest Call cocktail as you flip a Flairco bottle into a BarProducts tin and enjoy this months issue of Flairbar.com and say “Thank You” to the sponsors who keep our sport alive.